Clues from a crater-like sinkhole on the island of Kauai point back to a giant wave that came from Alaska at about the time European explorers were pushing west, seeing the Mississippi River for the first time. 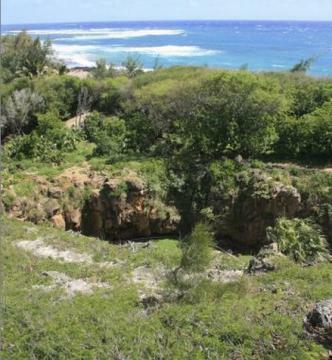 The Makauwahi Sinkhole on Kauai, which contains ocean deposits carried there by a tsunami, probably generated from an earthquake off the Aleutians about 500 years ago. The Makauwahi Sinkhole on the southeast shore of Kauai holds the mysterious equivalent of about nine shipping containers full of rocks, corals and shells from the Pacific Ocean. For the material to breach the amphitheater-like limestone walls of the feature required a wave about 25 feet high, said Rhett Butler of the Hawaii Institute of Geophysics and Planetology in Honolulu. Butler gave a presentation on the subject at the Fall Meeting of the American Geophysical Union held in San Francisco in December 2013. That wave probably came from a great Aleutian earthquake, Butler said. The tsunami probably struck between the years of 1540 and 1660, according to dating of the organic materials within the sinkhole. The great tsunami story starts with David Burney’s explorations of caves within the limestone complex. While Burney, an archaeologist, ecologist and director of conservation with the National Tropical Botanical Garden of Kauai, was trowling for and finding evidence of ancient people, he also discovered the layer of ocean materials about six feet below the surface. Butler noticed Burney’s work and wondered how large a tsunami needed to be to breach the most vulnerable eastern wall of the sinkhole. He dialed up tsunami-generating earthquakes on a computer model until he found one that was plausible. The tsunami Butler modeled had some collaborating evidence revealed at the same conference in San Francisco. The subject of last week’s column was a revealing hole on Alaska’s Sedanka Island first dug by Gary Carver of Kodiak. That research pit, inspired by a tsunami-carried driftwood log high above tideline, shows the sandy evidence of six big tsunamis, each spaced about 300 years apart. One of those sand deposits dates to the late 1500s. The wave that carried that sand might be the same tsunami that surged more than 2,000 miles and topped the wall of the Kauai sinkhole. Butler, who lives in Honolulu, sees the evidence for a past great tsunami as a warning sign. Current Hawaii tsunami inundation maps underestimate the water that would come from an earthquake similar to the one that soaked the sinkhole, Butler said. His modeled epicenter for the earthquake that would have sent the tsunami to Kauai was in the Aleutian trench somewhere between Adak and Unimak islands. Since the late 1970s, the University of Alaska Fairbanks’ Geophysical Institute has provided this column free in cooperation with the UAF research community. Ned Rozell is a science writer for the Geophysical Institute. A version of this column first appeared in 2006. This entry was posted in News and tagged Alaska, earthquake, Kauai, Makauwahi Sinkhole, sinkhole, Tsunami by admin. Bookmark the permalink.